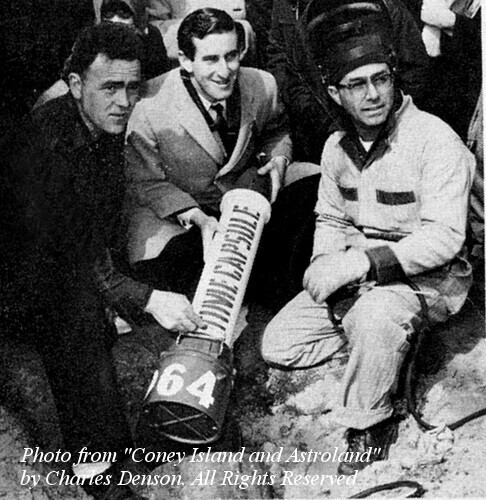 Coney Island lost an historical figure who helped transform one of the amusement area’s oldest properties into a space age theme park in the 1960s. Jerry Albert, the co-founder of Astroland Park with his father Dewey Albert, died on Thursday after a long battle with Parkinson’s disease. This year is the 50th anniversary of the founding of Astroland, which broke ground in 1962 and closed at the end of the 2008 season. Astroland was built on the site of Feltman’s, the restaurant and amusement park complex owned by Charles Feltman, the inventor of the hot dog. The new park started with little more than a miniature golf course, a Double Diving Bell, a Sky Ride, and six kiddie rides. When the Alberts decided to develop the park, Jerry Albert began making trips to the West Coast and Europe to seek out state-of-the-art rides. “The Mercury Capsule Skyride,” “The Ascension Tower,” and “The Rocket Ship Star Flyer” were among the space-age rides mentioned in an early press release about Coney Island’s new park. Neptune’s Water Flume was one of the early flumes made by Arrow Development, a pioneering ride builder for Disney, in the early 1960s right after the New York World’s Fair, and it was built specifically for this park. The $1.7 million Von Roll Astrotower from Switzerland was the first ride of its kind in the United States when it was installed in 1963. Jerry Albert took over the operation of Astroland Park after Dewey Albert’s death in 1992, notes Denson. After he retired due to the onset of Parkinson’s, his wife Carol Hill Albert operated the park until it closed. In 2004, the Coney Island History Project, a nonprofit that aims to increase awareness of Coney’s legendary and colorful past, was founded by Carol Hill Albert and Jerry Albert in honor of Dewey Albert. In 1987, on the 25th anniversary of Astroland, the New York Post hailed the Alberts as “the family that keeps Coney Island rolling,” adding that while so much of Coney Island had burned down or was in decay, the Alberts kept the Cyclone running and kept expanding the park. By way of explanation, Jerry Albert told the reporter, “We have sand in our shoes.” Spoken by those who have an intimate working connection with Coney Island, the phrase conveys an unwavering commitment to this place where the amusement industry was born. Funeral services will be held at 11 am 10 am Sunday at Plaza Jewish Community Chapel, 630 Amsterdam Ave at 91st Street in Manhattan, to be followed by interment at Mt. Lebanon Cemetery. RIP Jerry- you will be missed. You kept Coney vibrant and thrilling through some hard times- and brought much joy and happiness to many thousands of people. I will always remember some CYCLONE rides with you and Carol during one of the anniversaries of the CYCLONE! He was a tough egg, but he kept Coney Alive through its darkest days. R.I.P. Jerry! My heart goes out to Carol and the rest of the family. R.I.P. Mr. Albert….He gave me 1 of my 1st jobs as a teen…I really appreciated the opportunities afforded me by Mr. Albert…I truly am indebted to this great man…. Rest in Peace Jerry…. I onlt met you once but I grew up in ASTROLAND…. and had the pleasure of working there for several years….. you are and will always be loved and missed. Such sad news to hear about Jerry. I have some wonderful, fun, and amazing memories of my early years with him and our families at Astroland. He was usually the only person I could get to ride the Cyclone with me… and, he would actually look bored! My deepest sympathies to his family. He was much loved. May he rest in peace. He was the only one who cared about Coney Island and he made Coney Island what it is today. There will never be another one like him. Our deepest sympathy and condolences to his wife and family for he will live on in the hearts of many who love Coney Island!! !